Remember when you were young, and there was that kid who spent more time dissing you or others than making something of themselves? Maybe you wanted to let them have it, but you knew (or maybe your parents gave you some advice) that it was best to take the high road and focus on your strengths and success. There is some wisdom in this childhood scenario for grownups running businesses, product lines, and service areas, who are competing for awareness, customers, and marketshare. In every market, every town, every application space, you are going to face competition. And that's a good thing - for companies and consumers. But maybe you are considering making a move to directly market against your competitor. Is this a good idea? The answer is, maybe, but be careful. 1. They effectively create fear, uncertainty and doubt (FUD) about breaches in personal security if you use Google's products: "…the way they are doing it is making it harder for you to maintain control of your personal information." 3. 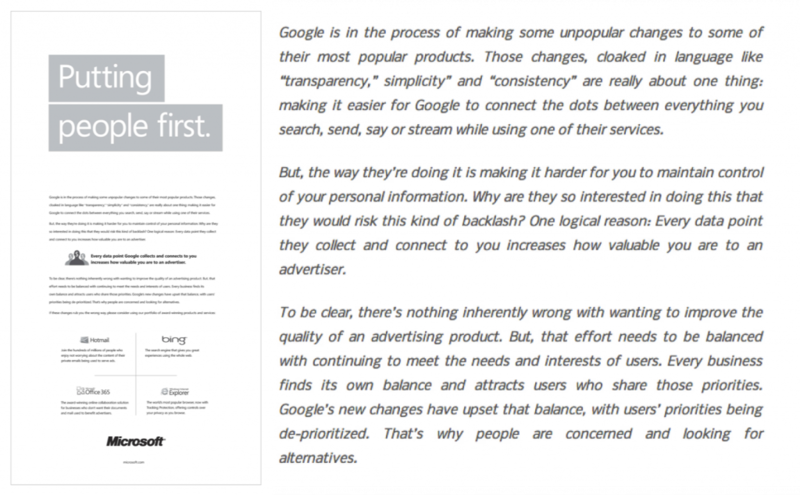 The tone is serious, professional, and clear: you can't trust Google, and we're doing it better. 4. The ad is designed to catch my eye and call out the controversy, and it did: I immediately saw it was a Microsoft ad directed at Google and I wanted to know more; it's easy to read, my eyes are drawn to the product boxes, and I got the message - FUD about Google. In a later ad, they modified their tone and I liked it a lot more: "If you're not comfortable with the potential of private email content or information in your private documents being used to serve you ads, we'd encourage you to explore our award-winning alternative: Hotmail and Office 365." 2. Giving airplay to Google. 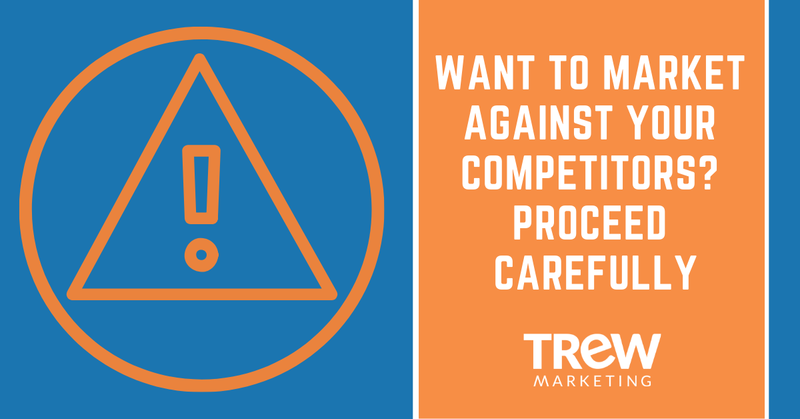 As with any direct campaign against a competitor, you are growing their awareness with your dollars. Thanks to Microsoft, I became much more aware of Google's security policies, and certainly was not going to trust Microsoft's word alone. So they caused me to study Google even more by raising the issue. In the end, by creating this fear with users, Google may have gotten more traffic from this campaign than Microsoft. 3. There was no credible call-to-action to drive me to learn more about Microsoft's presumed "more secure" approach. They were clearly just exploiting their competitor's weakness, but didn't have any technical, researched, or third-party information (white paper, webpage, etc) that I could visit to learn more. They just pointed me to microsoft.com and touted their competitive products. Lame! So, was it effective? Were readers inspired to check out Microsoft's products? Did the gains of directly exploiting Google's weakness outweigh the costs of all those ads in very expensive outlets and potential harm to Microsoft's brand? Maybe, maybe not. I'm sure the product teams at Microsoft would justify it, but as a consumer, it didn't inspire me to buy Microsoft, although I will say today, between this campaign and all the mainstream media coverage on the topic, I am more weary of Google than I used to be. 1. Increase investment in search marketing around keywords where you directly compete. Place ads, create landing pages, and generate targeted content that drives clicks and organic search to your site vs. your competitors. 2. Don't call your competitor by name. Rather, generalize with "other + your category", such as "other service providers", "other test integrators", "alternative IT consultants." You can also indirectly refer to your competitors by using their branded colors. This is a less direct way of calling out your competitors, while still getting the message across. 3. Create comparison tables of specs with your company name in one column, and "competitor 1", "competitor 2", etc in follow-on columns. As long as you can back up your data if someone asks, and you are accurate in your depiction, you can communicate your point without giving a nod to competitors by name. 4. Start a FUD campaign around your competitors' weaknesses by focusing on your strengths. For example, for an enterprise software integrator, a campaign could be "Five Questions You Should Ask When Selecting an ERP Integrator". Create a white paper, short video or webcast, and push out via social media and your blog to educate the market in a sound, professional manner what they need to consider. 5. Devise a geographic attack. As a challenger with less resources than the market leader, you will not be able to go head-to-head matching the leader's products, advertising, and price promotions. Instead, be more strategic than your opponent and identify shifts in regional market segments that cause gaps to develop, then swiftly fill those gaps before your competitors do. To end on a light-hearted note, here's the very funny, albeit very risky General Motors TV commercial that ran during the 2012 Superbowl touting Chevy vs. Ford trucks. Do you like the Microsoft ad? The Chevy commercial? Have you tried some of the suggested alternative tactics? 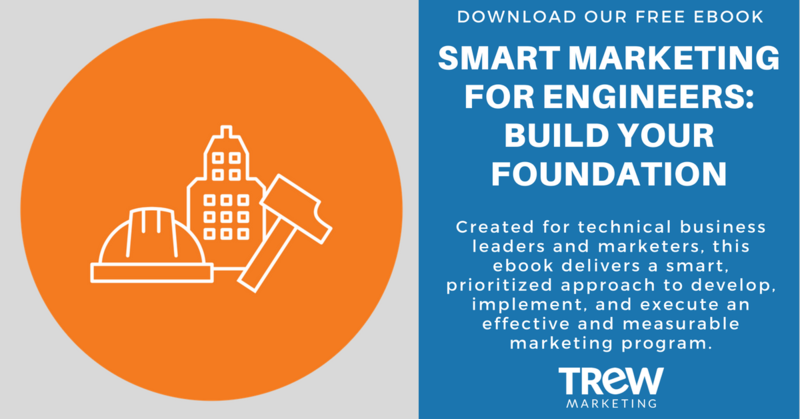 Learn more about how to position your brand by downloading our free ebook, "Smart Marketing for Engineers: Build Your Foundation."